Admit it, you’ve always wanted a Build-A-Bear stuffed animal sporting your favorite NFL team’s colors and logo. Football fans can customize their own Super Bowl/NFL-themed Build-A-Bear Workshop creations, and fill shopping bags with the largest selection of exclusive Super Bowl merchandise available anywhere, at the NFL Shop at Super Bowl at the Georgia World Congress Center (GWCC) leading up to Sunday’s big game. There are actually two NFL Shop locations at the GWCC. And there’s another one at Centennial Olympic Park during Super Bowl LIVE, which runs today, Thursday, Friday and Saturday. Here’s the rub: One of the shops is located in the GWCC’s registration hall on the main level and entry is free, while the other one is inside the Super Bowl Experience in Building B’s exhibit halls, and requires a ticket to the Super Bowl Experience. Note: whereas no ticket is required for the NFL Shop located on the GWCC’s main level, guests must go through security checkpoints to enter the building. An array of Super Bowl and NFL merchandise awaits guests at the NFL Shop at the Georgia World Congress Center. 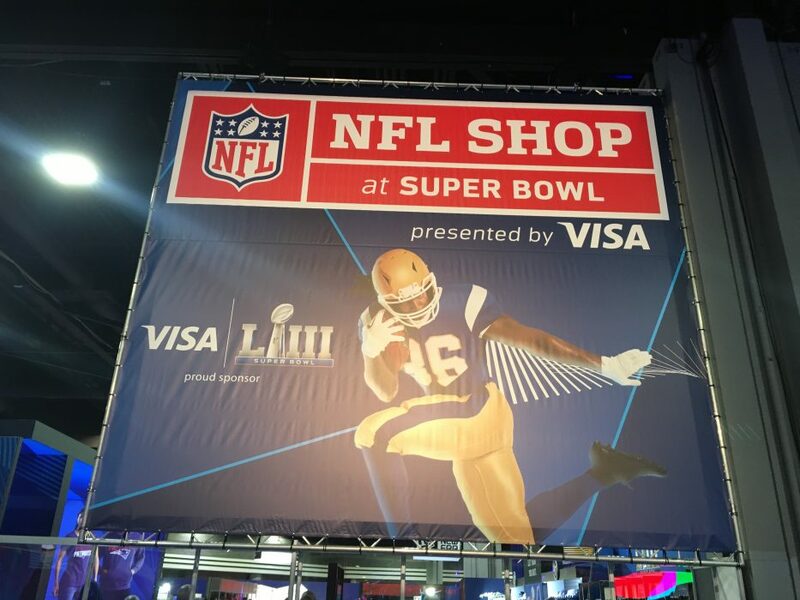 The NFL Shop inside the Super Bowl Experience is massive, covering 25,000 square feet of retail space, akin to one of those bigbox sporting goods stores, and it’s not just Los Angeles Rams and New England Patriots gear – the two teams squaring off Sunday in Super Bowl LIII at Mercedes-Benz Stadium. All 32 NFL teams are represented, with a healthy selection of Atlanta Falcons items for the hometown fans. Nike Opening Night uniforms, Tommy Bahama shirts, Vineyard Vines polos and jackets, Nike Game Jersey emblazoned with Super Bowl LIII patch, New Era Cap Super Bowl LIII collection, Levi’s jackets with team patches and customized Northwest Blankets. Former Falcons QB Michael Vick’s New Era 9FIFTY cap, featuring his jersey No. 7 and the NFL shield, will be available starting Thursday at the NFL Shop and online at neweracap.com, retailing for $100. Vick will also be on-site at the Super Bowl Experience for photo and autograph sessions from 3-4 p.m. Thursday. NFL Shop at the GWCC hours are: 3-8 p.m. today and Tuesday, 3-10 p.m. Wednesday and Thursday, and 10 a.m. to 10 p.m. Friday and Saturday. Please visit the Fan Services Desk in the main lobby or call (404) 586-7253. Is this shop open on Sun day of the game at all? 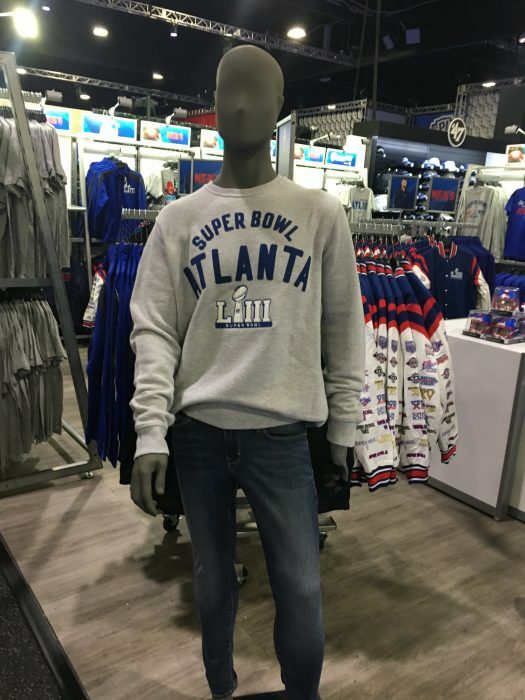 Hi Brandi, the NFL Shop at the Georgia World Congress Center will be open until 5 p.m. today. Happy shopping! What’s the last day of the shop is open? The NFL Shop at GWCC closed yesterday. However, the NFL Shop at Atlantic Station is open today until all items sell out. Not on the GWCCA’s campus.